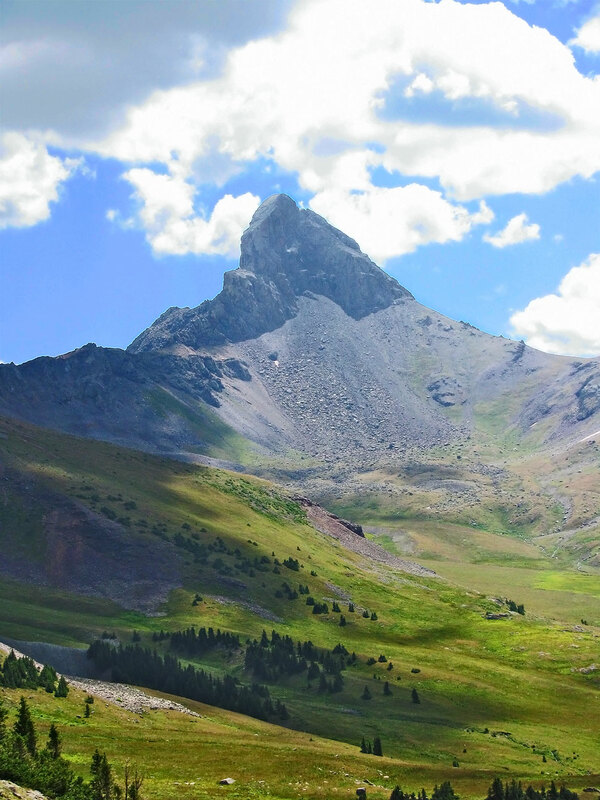 Verdant, rugged, and with the dagger sharp peak of Wetterhorn rising above it all, the Wetterhorn Basin is one of my favorite hikes in Colorado to enjoy on a summer day. Best experienced as an overnight trip or as a long day-hike, this trail offers spectacular and quintessential Colorado backcountry scenery for the hiker willing to tackle its 10.6 mile (or more, depending on how far you wish to go) roundtrip distance as well as its 2,980 ft. of elevation gain. This hike is unique in that some of the most rugged and fluted peaks in the San Juan mountain range can be seen from vantage points throughout the duration of the hike. Views of Coxcomb, Precipice, and Wetterhorn Peak can be had from various vantage points that come often throughout this hike. The West Fork Trailhead is located at the end of a 1 mile section of rugged 4wd road. For passenger cars, park and begin hiking at a point just before the West Fork Creek crossing where a sign is posted indicating a narrow and rough road ahead. From the rough road sign, hike another 1 mile along the road to the West Fork Trailhead. From the trailhead, the trail remains above tree line for most of the way, and follows the West Fork of the Cimarron River as it tumbles down from near a high mountain pass. The trail enters the Uncompahgre wilderness at the 0.6 mile mark. For another 2.2 miles, the trail ascends the West Fork valley climbing through occasional forest and over gulleys washed deep by heavy snow melt and avalanche debris and eventually enters a clearing at the head of the valley. Here, the trail switch-backs toward a rocky pass visible just above. Coxcomb Peak’s reddish cliff face can be seen to to the leftside of the pass. Beyond the pass is Wetterhorn Basin, a high treeless basin on the western side of 14,015 ft. Wetterhorn Peak. From the pass, views of Precipice Peak, Chimney Rock, Redcliff, and Coxcomb Peak stretch toward the north. Continuing beyond the pass, the trail descends heading south where the imposing wedge shaped summit of Wetterhorn Peak comes into view. You may notice that these peaks have Swiss names like Wetterhorn and Matterhorn. These peaks remind many of Switzerland. In fact, the nearby town of Ouray is known as the ‘Switzerland of America.’ Just like in the Swiss Alps, during the peak of summer, abundant alpine wildflowers make a showy display here in the Wetterhorn basin. If you have time, and weather permits, head for the ridge to the south of Wetterhorn basin for spectacular views to the south and west. Return back the way you came. Camp over 100 ft. from lakes and streams. No motor vehicle, bicycle or hand cart use within wilderness boundaries. For more backpacking trips and ideas, see my Backpacking Guide to Colorado’s Top 8 Trails.